If you’re like the fried egg staffers, then you didn’t budget for a trip across the pond to enjoy the 145th Open Championship at Royal Troon. However, that doesn’t mean you can’t score some dope Royal Troon gear and roll up to your British Open (ahem Open Championship) Party like a boss. Here are this week’s favorite finds. Breezy o’ Troon will be no match for this stunning windbreaker. The perfect accompaniment for a cool summer evening, this jacket can be easily crammed into the nooks of your golf bag or tied around your waist for extra style points. 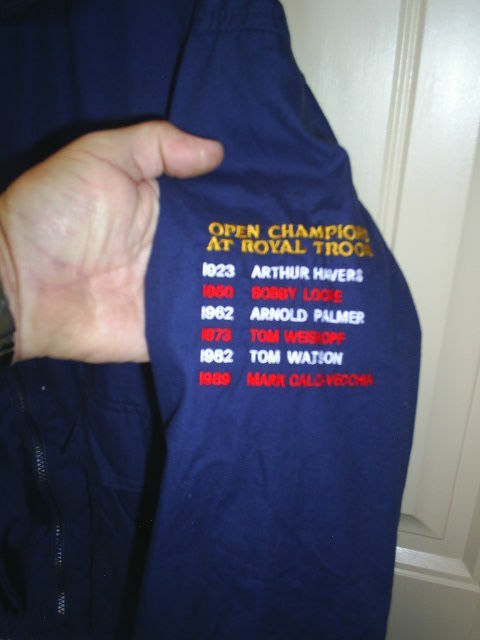 Just remember to keep that left sleeve pointing out as it bears the names of all of Royal Troon past Open Champions. Set your pint down in style as you celebrate Weiskopf with a Schlitz or whatever vintage swill you’re calling cool these days. This set of six coasters is more than your beer allowance for 6 months. However when you tell your friends that heard about them on the fried egg, golf’s most underground website, they’ll respond, “Who?” Exactly. This beige polo from Salzenger is perfect for your commute to work. When you don this dapper tunic no one will notice the coffee stains as you try to Snapchat, read your Kindle, and sip your slow brew java while navigating traffic out to the suburbs (gross). Did we say arm candy? The rest is history, and while we’re talking about history tell her everything you know about Tom Watson and the Open Championship. If you’re looking to take her back to your place, you better have more than those dope coasters to entertain her. Why not show her your etchings or at least someone else’s? Featuring a stunning 18th hole view, this Linda Hartough Lithograph is a beaut and sure to brighten up any garden unit apartment. Educate yourself. Do you even know Crampsey? We prepared at EPIC guide to the 2016 Open Championship at Royal Troon. However, it would suit you to have all the facts, and maybe impress people with more facts from obscure books. There is no better guide to Royal Troon than R.A. Crampsey’s The Breezy Links o’Troon: A History of Royal Troon. Put it on your shelf and enjoy a few passages as you smoke your hand rolled cigarette. If you're keeping score, each of these listings is a birdie. Wouldn't it be even better to keep score on an authentic Royal Troon scorecard? Well, we can do you one better with this vintage Royal Troon scorecard and ticket stub for the 1968 Amateur Championship at Royal Troon.